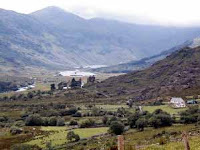 Walsine Pierce: THE GAP OF DUNLOE: An Irish Travel Blog, Enjoy! 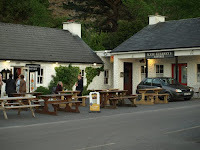 THE GAP OF DUNLOE: An Irish Travel Blog, Enjoy! There are approximately 3 million people in Ireland and 40 million people of Irish descent in America. Those in Ireland really do not appreciate someone like me, with my West Virginia twang, saying "I'm Irish", although my Dad's people did come from Ireland. "Ce'ad Mile Fa'ilte" meaning "You are welcome a thousand times over". I have been told by the Irish that they resent those who come to Ireland with fine dress and expensive manners. The Irish are a plain, fun loving people. The "Ugly American" syndrome. This picture on the right was taken of my lovely wife, Julie, and I during our first visit to Ireland. I dressed plainly, my wife, on-the-other-hand, dressed like the other American ladies in our tour group. When I returned to solo backpack the west coast of Ireland, I dressed exactly like the Irish. No, I didn't blend in at 6' 2", but I did not stand out. 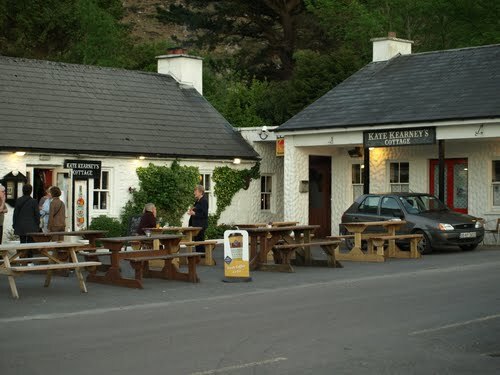 I enjoyed every moment and every inch of Ireland--well, maybe not the porter--but otherwise, nothing more so than climbing through the Gap of Dunloe and boating down the Lakes of Killarney. The Gap of Dunloe is one of the most stunningly beautiful parts of County Kerry. Stretching through the MacGuillicuddy Reeks mountain range, it simply must be experienced to be appreciated. A van took the few in the group, who were wise enough to know that the Gap of Dunloe was far more beautiful than the alternative shopping trip would be, to Kate Kearney's Cottage. 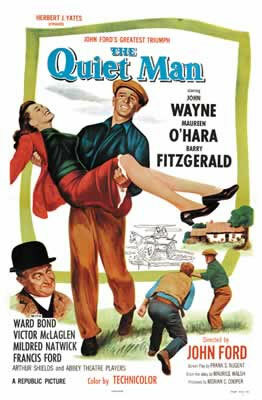 Just as quaint and Irish as the name sounds, I bought myself a shillelagh and a plaid golfing cap with a tassel on top. Nah! No body in Ireland dresses like that but it sure impresses the people back home who don't know the difference. The tea and scones were marvelous. 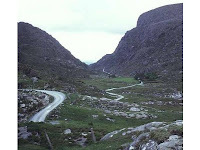 My wife and I, along with friends from Michigan, boarded a trap, a small cart for four, pulled by a small Irish horse and headed up the six mile trail over the mountain and through the Gap of Dunloe. These little traps have been in the families down through the generations. Our driver, who walked, was named Paderick and his horse was named Billy. IF YOU KNOW PADERICK, SAY HI FOR ME. Through the Gap of Dunloe you come to Black Village, Paderick's home. He introduced us to his Mother, a gracious lady with red hair and freckles. Paderick who was only 16 years of age at the time, was a well propertied young man. In addition to his little horse, Billy, he owned sheep and geese. He knew which were his by the colors of the paint dobbed on them. There were no roads to this isolated, Irish village. 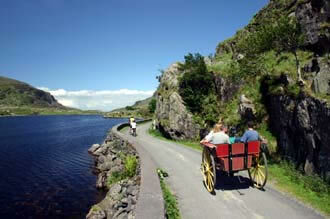 No where in this land of castles is more beloved than the Killarney Lakes. From the Black Village we boarded small boats for an exciting ride down three lakes to our van which was now at Ross Castle, regaled on the way with the most exaggerated tales. There is a saying that "The British and the Americans are one people divided by a common language". This is true everywhere around the world. The same word can have an entirely different meaning. Asking about the "Rest Room" in Ireland is a social faux pas. The word you're looking for is "jacks". The men's toilet is the "fir jacks" and the ladies toilet is the "ban jacks". If you are sincere, the Irish are a forgiving people so don't sweat the language. AMERICA GOING TO HELL IN A HAND BASKET? Hardly! THE CHANGING TIMES: Ever And Always! AMERICA, THE BEAUTIFUL: America, The Resilient! JUDGE THE FUTURE BY THE PAST?